Did you know 1 in 5 childhood deaths are due to malaria? But that a single net can prevent malaria and help a child to sleep sweetly tonight? Together and in unity with other friends/readers, they raised $166.31! WHOA!! Way to go!! That’s enough for 20 nets! 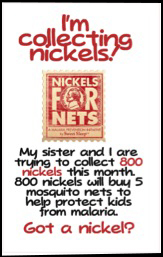 Here are links to Amanda’s and Erin’s blog posts about their experience with Nickels for Nets if you would like more information! 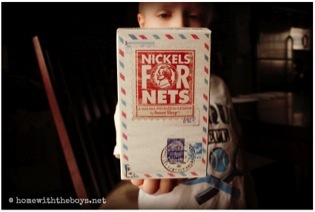 If you would like to see Nickels for Nets resources then click this link! The great thing about nets is especially seen in God’s work with us in Uganda. 90% of the childhood deaths due to malaria are in Africa. When Sweet Sleep is able to give beds to an orphanage we know that kids will be sleeping sweetly with their new bed, Bible, and mosquito net. But, what you may not know, is that there are kids who come out of HIDING to get registered for a bed! These kids usually are HIV/AIDS positive. When the kids come out of hiding, Sweet Sleep registers them with our partner Health Alert who is able to give them the medicine that they need for HIV/AIDS and they also receive A NET. In the past two years we have had over 1,000 children come out of hiding to be registered! That’s a lot of life saving nets! This wouldn’t be possible without the obedience and heart of people like Amanda, Erin, their kids, and YOU. What were you going to do with your change today? Why not create a lasting change for a child in need? Head over to our DONATE page and be sure to put “Nets” in the comment box when you make your gift!